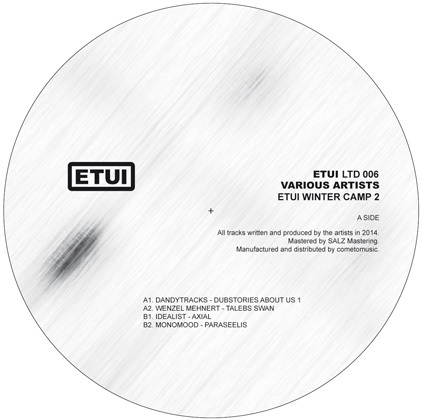 Etui Records has opened the winter camp again and invited friends and fellows to open their boxes of dub and deep techno tracks. To keep your hearts warm when it’s cold outside, we are about to hand you a musical fireplace. This year´s Etui Winter Camp starts with the romantic moods of Insect O.s “Sands Of Rainbow” and Monomood´s “Paraseelis”. After founding his own Abstract Animal imprint for some proper techno and his “Parameter One” release on Uncanny Valley sublabel Shtum Monomood finally returns to Etui Records. “Talebs Swans” by Tiefenrausch´s Wenzel Mehnert is a reduced fusion of space tech and dub step followed by a true dub techno piece by Dandytracks aka Daniel Madlung and Mandy Jordan. Matthias Springer takes you to the dark side of the winter with some acidish sounds in his “Dark Orbit” and Frank Hellmond brings in some analogue warmth with his “Lost”. The best thing you can do when it´s cold outside is dancing to “Stellar Remnants” by Swiss Alessandro Crimi and the old-schoolish techhouse of Insect O.’s “Transatlantik Chords”. Zurich based Idealist toped a funky bassline with sparkling chords for the techno mood in his “Axial”. Finally Sydney´s passionated techno artist Squarepeg rounds up this year’s album with his live jam “Green Dots”. 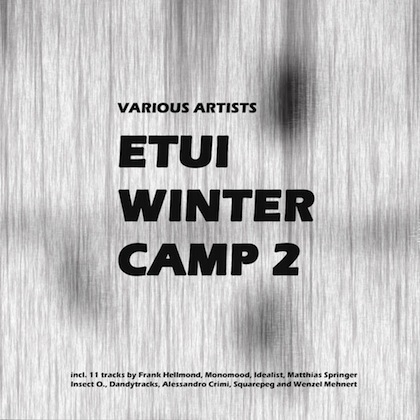 Etui Winter Camp will be released as digital album incl. 11 tracks and 4 tracks vinyl edition. You can buy the digital album 1 week in advance on our bandcamp shop. Copyright by Etui Records 2014. Mastered by Salz. Vinyl distributed by cometomusic. youANDme: great compilation with deep & dubby vibes! thank you!!! Todd Bodine: Awesome album. Love all tunes here. Radio AMDJS (St.Petersburg): Some wicked dub cuts are on board. Well done! Radio NOICE! – Harry Ruffner: very nice atmospheric house and Techno. Great ear candy and a fine example of how a compilation should be presented. Radio Diversions, CHRY.FM Toronto: wonderful compilation – especially like the atmopheric Dark Orbit! Electric Indigo: pretty nice dubtechno compilation.